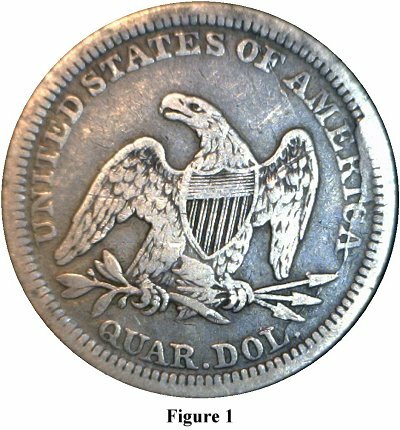 The Liberty Seated Quarter series is well known for having a large number of rare and scarce issues. That is undoubtedly one of the key features that attract those who collect the series and deter those who do not. However, there is arguably something for everyone with an interest in Liberty Seated Quarters. Variety collectors, in particular, will find many interesting varieties amongst the most common dates in the series; and, though certainly gaining in popularity, many seated quarter varieties still “fly under the radar” of most dealers and collectors and can be purchased with little or no premium. After consistently low mintages from the inception of the series in 1838 until 1852, the Philadelphia mint abruptly transitioned into mass production following the silver coinage weight change in 1853. During the 6 years from 1853 – 1858 a total of 54,767,200 Liberty Seated Quarters were produced by the Philadelphia mint; an average of more than 9 million pieces per year. It is thus not surprising that these issues represent a fertile ground for those interested in die clashes, misplaced digits, cuds and rotated dies. Many of these varieties and “errors” are not cataloged and await the patient and dedicated collector or collectors who wish to document the existing varieties. Until that happens, studying common date seated quarters provides the collector an opportunity to find things he (or she) has never seen before; or perhaps no one has seen, or noticed. The Philadelphia ANA show during August 2012 provided just such an opportunity. The coin pictured is a raw 1854 quarter grading VF. The reverse cud extends from about 2 o’clock to 5 o’clock and hasn’t been previously documented.